Crazy for Ewe – "Crochet"
The snow was beautiful and cozy, but I'm ready to get out of the house. Although my driveway is still covered, the main roads are clear and dry, and we will be open and ready for business today! Good thing too, because we have two fabulous projects happening - first is the Messy Bun Hat Crochet along. Second is this beautiful infinity cowl "That Nice Stitch" in Dream in Color Classy with Cashmere - Just one skein is all it takes. Whether you're knitting or crocheting, I look forward to seeing you around the table this afternoon! Knit cozy my friends! This is the book we'll be using for our Crocheted Vest class, and for several other crochet projects in the future. There are 15 different designs, all of them cute. Next to the one we're doing in the class, this one is my favorite. Don't you just love the draped front on this cardigan - very on trend! This circular top is very sweet with its graceful open collar and scalloped hem. I think this one is really smart - wear it along as great summer shell, or layer it over a blouse or under a jacket. Terrific wardrobe piece. If you crochet, this is book you should have in your library. If you don't crochet, these designs will make you want to learn! I'm not carrying the book in the shop, but you can order it on Amazon through the link below. I'm a knitter to the depths of my soul, but you know, some crochet projects are just so compelling that I vow to learn. Take for instance, everything on my Crochet Pinterest board. Isn't it interesting that Dionne from the Berroco Mixer trunk show is right there too! My other current crochet crush is the Polly Poncho that Mary designed for May First Friday. Named for her beautiful and trendy California daughter, the Polly Poncho is stylish and fun. Perfect over a tank or a tee with fringe that is current and modern. It's that third layer that makes an outfit and adds a splash of color to your look. Not only is Polly adorable, it's a perfect introduction to crochet. Nothing too complicated, just chain (which you probably already know) slip stitch, single crochet, and triple crochet. That's it- that's all you need to know. Smooth Modern Cotton is easy to crochet, light and cool to the touch, and machine washable to boot. The hardest part will be choosing from the dozens of mouthwatering colors. Mary will be on hand to help you get started this First Friday, May 1. You can whip this up in no time flat. Pattern is complimentary with 2 skeins of Berroco Modern Cotton. Bring, or buy at the shop, a size G hook and some locking stitch markers. See you then! Lovely Bev wore her newly completed Cather crochet top in to the shop today. She added two full repeats to the length. The yarn is lovely Manos Serena in a very subtle variegated blue green. Perfect. Nice work, Bev. Last Friday, William, our UPS man, brought in an armful of boxes. I was surprised and delighted that one of the boxes was full of sample garments in beautiful Serena from Manos del Uruguay. I hadn't expected the trunk show until next week but, what a wonderful surprise! We get to have it for a nice long time, which is good, because I really want you to have a chance to see it. There are seven garments in the show, and they are all just terrific. I love Chopin, an open stitch tunic which is fun belted over black leggings. 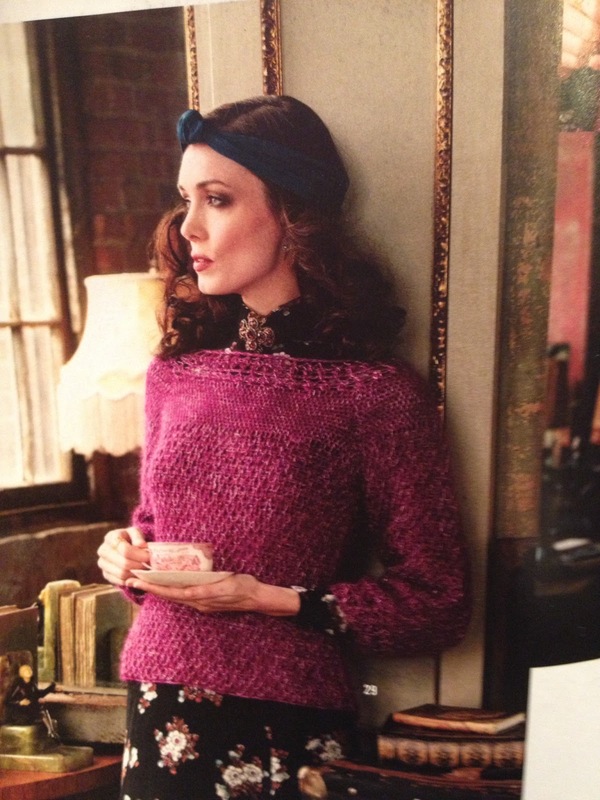 and Kashmina, a drape-front cardigan with set in sleeves and an all-over lace and cable pattern. Ginni was there when the box arrived, and she liked the two short-sleeved sweaters, Alcott and Stowe. A surprise for me was the beautiful crocheted Cather, which we'll be featuring in a beginning crochet class this spring. We'll be doing the trunk show this Friday, February 9 in Leonardtown from 10 a.m. to 1 p.m. and Saturday, February 10 in La Plata from 11 a.m. to 2 p.m. Don't miss your chance to see these and other beautiful Serena garments in person. Beatrix the Sheep rocks a new Manos Silk Blend cowl! Lately I've been searching Ravelry for great crochet patterns, and found the "Calm Cowl," a free download. It calls for about 400 yards of a DK-weight yarn. Ellen suggested the Silk Blend, and picked out the lovely earthy blue/turquoise/gold blend. The cowl worked up quickly and easily on a 5.5mm hook (size I). I'm really happy with it! Next up? There's a really sweet shawl that's on my mind, and may soon be on my hook! Okay, so it's been a month since any posts. Sorry. It's not that stuff hasn't been happening at the store - truth is that somehow my digital camera software isn't on my laptop anymore. No clue how it got wiped, and the worst of it is that I can't find the original CD either. I'm sure I put it in a safe place so we're unlikely to see it for some time. So, you'll just have to wait to see Duffy's prize-winning Clapotis, Carol's baby sweater, and the luscious new Silk Rhapsody from Artyarns. I promise this last will definitely be worth the wait. This fabulous design from Annie Modesitt is a crocheted version of her popular Cocoon Shrug featured on the cover of Vogue Knitting last fall. We 'll be scheduling a class on this soon, so check your newsletter or the shop site. 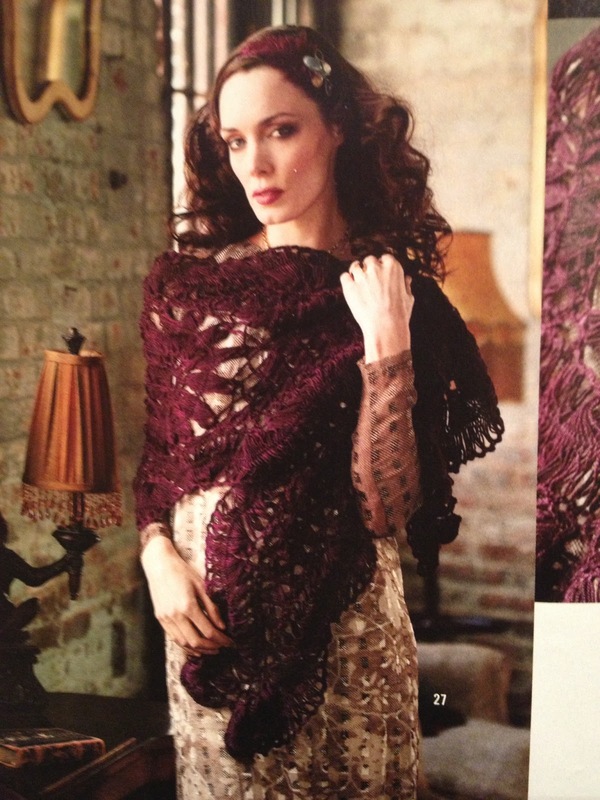 Annie's pattern's in the current issue of Interweave Crochet Spring 06 which has many other wonderful projects as well. Knitting will always be my one true love, but I'm itching for a little fling with crochet. Now, do I want mine in crisp white cotton, or in something pink? How about you?